If your eyes start to twinkle when you think of your next holiday in the Ardèche, it's time to book your stay at La Plage Fleurie! And if you have arrived on this page, the only thing left to do is make a choice from which location you prefer to realize your dream! The perfect compromise between a mobile home and a tent canvas, the Tithome chalets are convivial and can accommodate 4 to 5 people. These units have a kitchen and a water point close by. Washing-up and washing facilities are in the campsite sanitary blocks. The Moorea mobile homes are compact and economical with their integrated terrace but, that having been said, do not skimp on comfort. They have a kitchen equipped with a large volume of cupboard space, an average-sized fridge with a separate freezer compartment and a microwave. In the master bedroom, a suspended storage unit at the foot of the bed, specifically fitted below a bar, enables you to increase the storage capacity. There is a dedicated cot space. 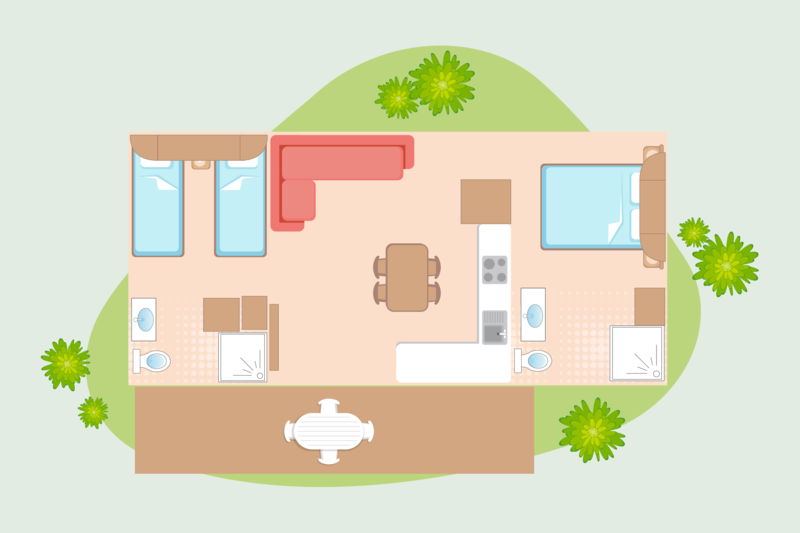 The Bali mobile homes can accommodate up to 5 people (the 5th bunk is the sofa bed in the lounge area which converts). These fully-equipped mobile homes have a spacious lounge area, 2 bedrooms for parents and children, a separate shower and WC and fully-equipped kitchen. 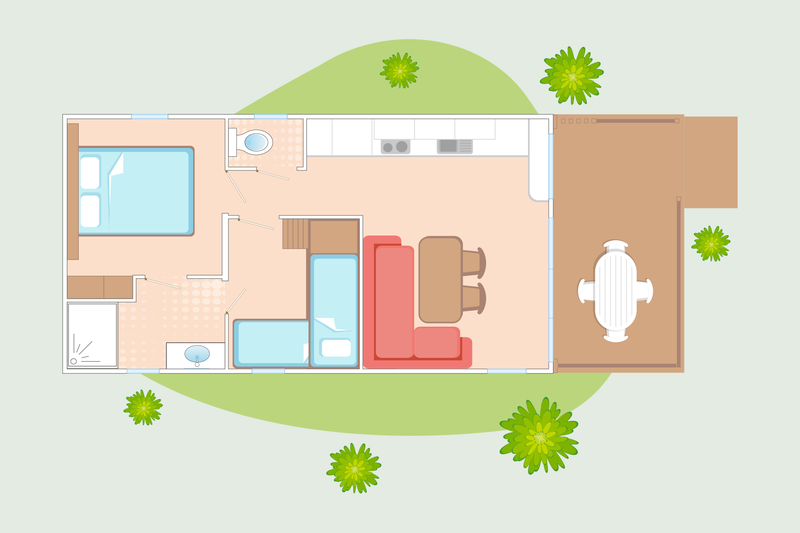 With their large windows which open out onto a covered terrace, the Riviera mobile homes offer the luxury of space. Perfect for 4 people, they can accommodate up to 5 people, with a third bunk bed (able to take a maximum weight of 50 kg) in the children’s bedroom. Alternatively the 5th bunk is the sofa bed in the lounge area which converts. For your comfort, this accommodation is equipped with an extractor hood in the kitchen, as well as air conditioning. 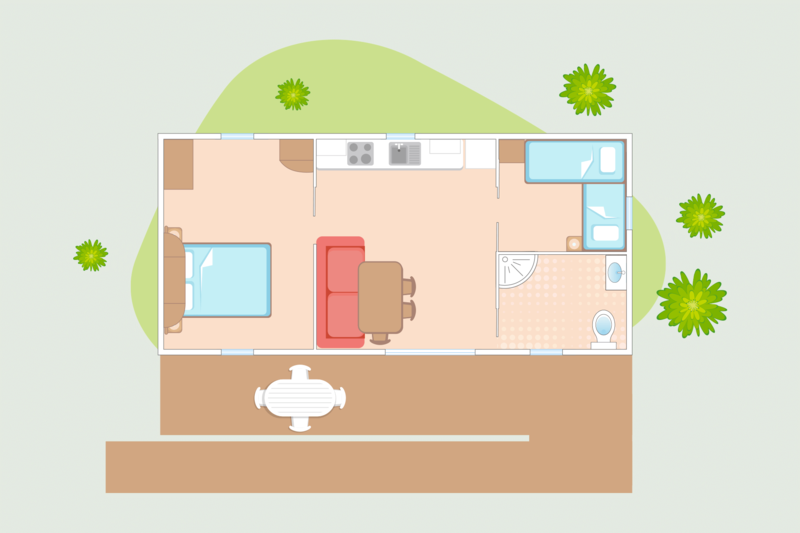 This mobile home is specially adapted for people with reduced mobility. All rooms are accessible in a wheelchair. The kitchen is spacious, with a large work surface and a return area of 150 cm, as well an average-sized fridge with separate freezer compartment. The main bedroom occupies the full width of the accommodation for optimal comfort. These modern mobile homes will provide you with a dream level of comfort during your camping holiday. They are equipped with an en-suite shower room in each bedroom (2 shower rooms! ), 2 WCs, a large covered terrace with two sunbeds, air conditioning for hot days, Wi-Fi access, a television and a large fridge-freezer. The Calys mobile homes, which are state of the art, with the appearance of a holiday studio, offer independence. 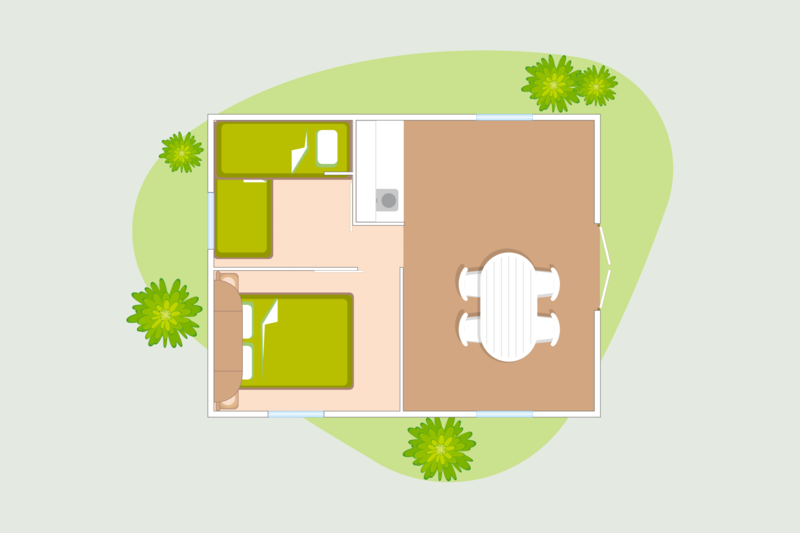 They have 2 bedrooms that open onto the terrace, each equipped with an en-suite shower room and a toilet. Large Italian showers and a dressing table in the bedrooms, as well as a hairdryer and dishwasher, make these mobile homes exceptionally plush accommodation! A Wi-Fi network connection, as well as a television, is included in these units. 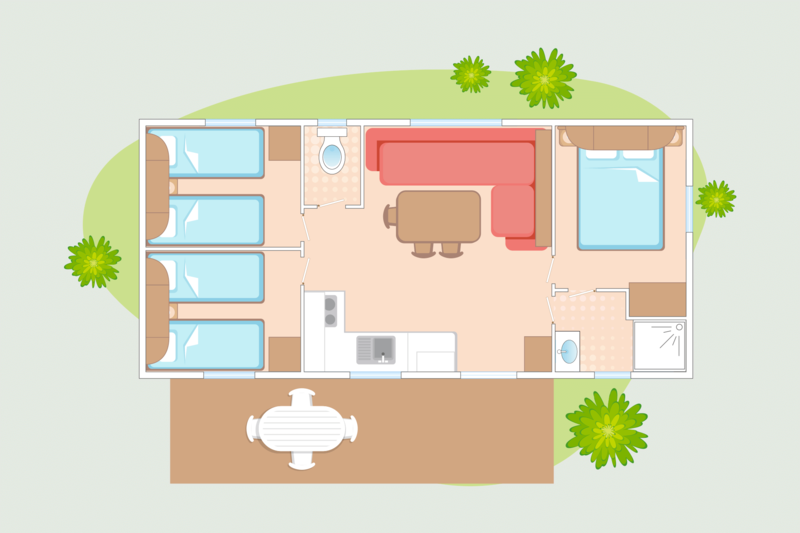 Our new Mobil Home LIVIA is ideally located, with a riverview and has a cozy open layout. The little bar on the veranda connects the kitchen with the terrace. The glass patio doors provide a beautiful light in the living room. The bathroom is accessible from every room. The equipment of this Mobil Home is maximum. Within a “habitat” spirit, the contemporary design of the New Valley mobile homes will offer you a large interior space, with a refined design and generous storage space, thus achieving an incomparable level of luxury. Moreover this accommodation has air conditioning and a television. There are only two units with this design on the entire campsite, having lovely private plots close to the river. Now with air conditioning ! 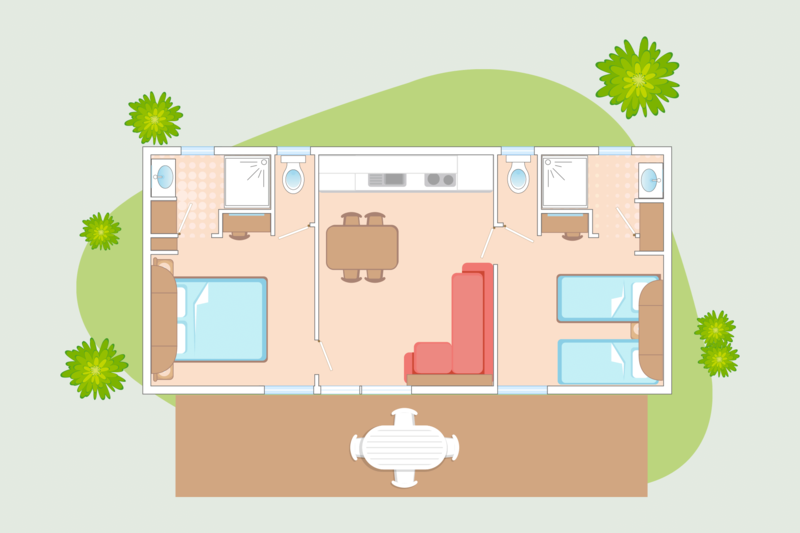 The Java mobile homes are perfect for large families or multiple couples in friendship groups. With their kitchen having a wood finish, their perfectly matched furniture, their touch of contemporaneousness and the best facilities for your comfort, these mobile homes, with a large covered terrace, are just waiting for you! This is the same design as our Java mobile home, but more fully equipped. 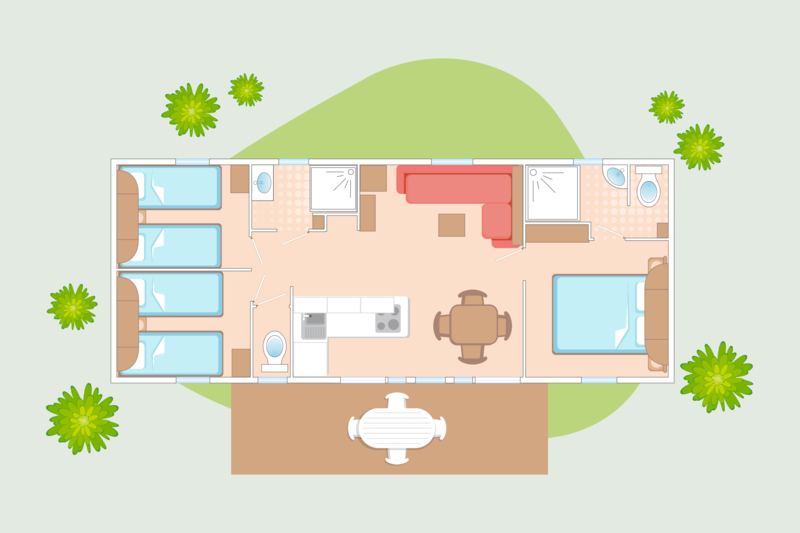 The Tiki mobile homes offer 3 separate bedrooms, a large living area and a large covered terrace. We have added more to this unit by including a Wi-Fi connection, air conditioning, television and sunbeds. Able to accommodate up to 6 people, these new mobile homes with 3 bedrooms have a master suite, with a large Italian shower (a type of ‘walk-in’ shower) and a private WC, then another shower room and WC close to the children’s bedrooms. The kitchen opens both onto the terrace and the large lounge area, combining comfort and conviviality. 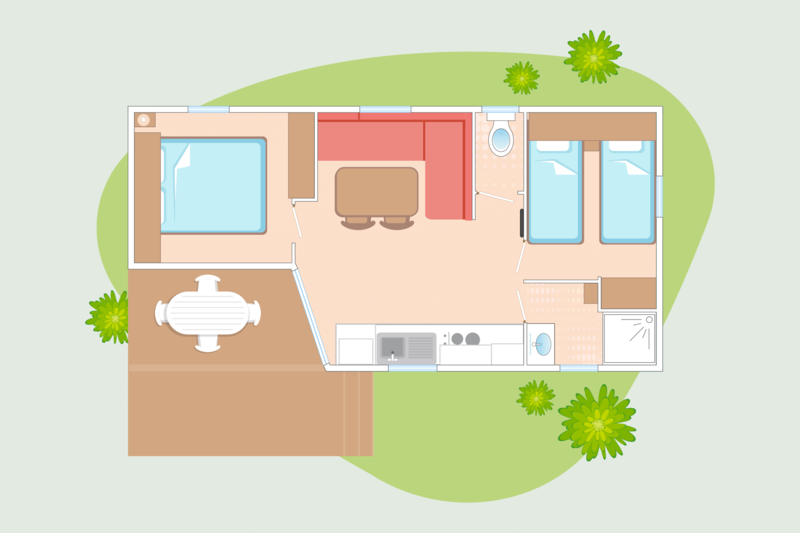 A Wi-Fi network connection, as well as a television, is included within these mobile homes. Similar to the Orion mobile homes, the Sirius mobile homes are extremely comfortable, having an exceptional setting, with a terrace, affording a view over the river and our beautiful rock! 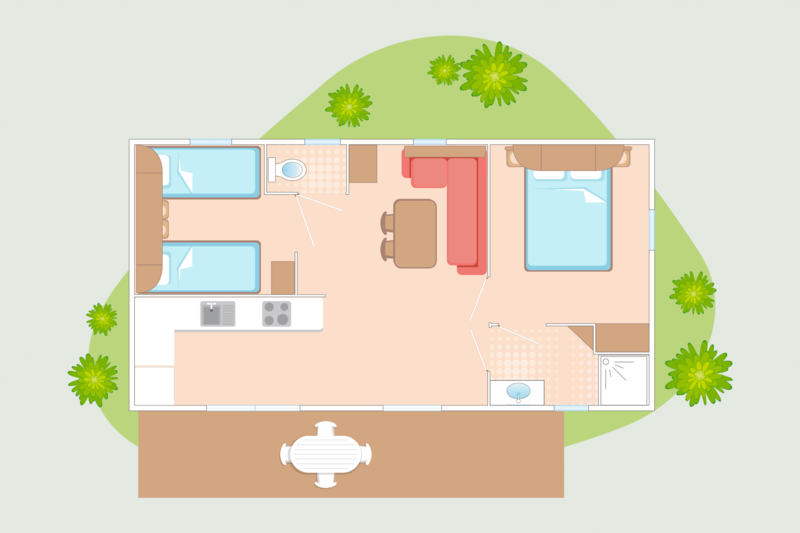 Able to accommodate up to 6 people, these new mobile homes with 3 bedrooms have a master suite, with a large Italian shower (a type of ‘walk-in’ shower) and private toilet. In addition there is a further shower room and WC close to the children’s bedrooms. The kitchen opens both on to the terrace and the large lounge area, so that you experience the combination of comfort and conviviality. 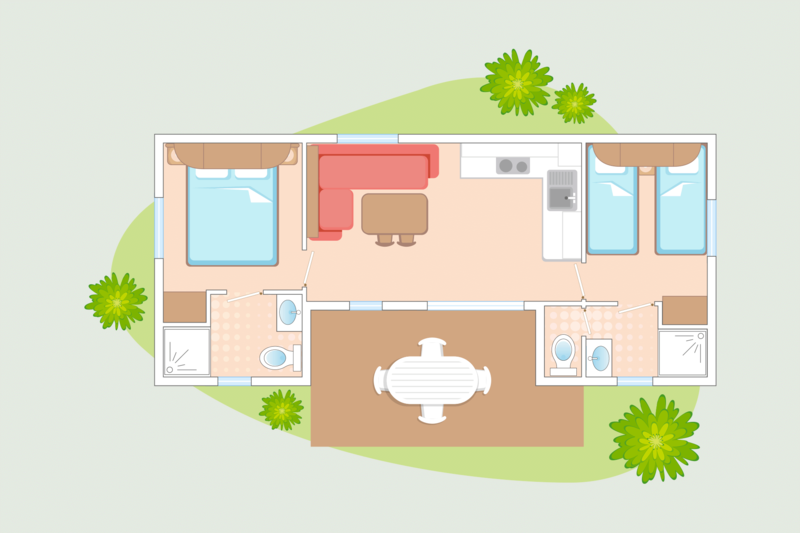 A Wi-Fi network connection and a television, is included in these mobile homes. The pitches are located on both the river side and the pool side of the campsite. The plots have a greater or lesser degree of shade, depending upon their location. Some (on the pool side) are separated by hedges. The average size of our pitches is 100 m². An electrical connection (10 amps) is included, and needs a male adaptor plug (Ref: P17 CEE). Go to the campsite reception to finalise your booking and pick up the keys to your holiday hire accommodation. Our team will be at your service during your entire stay. It then only remains for you to put down your bags!